A space for food and art! Nestled in the heart of the busy streets of Koramangala is a café like no other. Dyu Art Café aims to fuse together two elements essential for an escape from the hustle and bustle of the city – food and art. Following their passion, the four young owners of the café – Rezvin Nazer, Mathew T.F, Sadham Alikoya and Vighnesh Venugopal – started Dyu Art Café to create a food experience that is different. Apart from serving Italian and Continental, Dyu Art Café is an art gallery that houses a collection of work from both budding as well as established artists. “We have tried to keep a balance, a few professionals and a few amateur artists, so that exposure is given to the amateurs through the established artists. Bose Krishnamachari, the founder member and President of Kochi Biennale Foundation and Biennale Director of international exhibition of contemporary art, is the inspiration for this place on the art part of things,” said Vignesh. Walk into Dyu, which means brightness in Sanskrit, and you are taken into another world where the predominant feeling is one of peace. 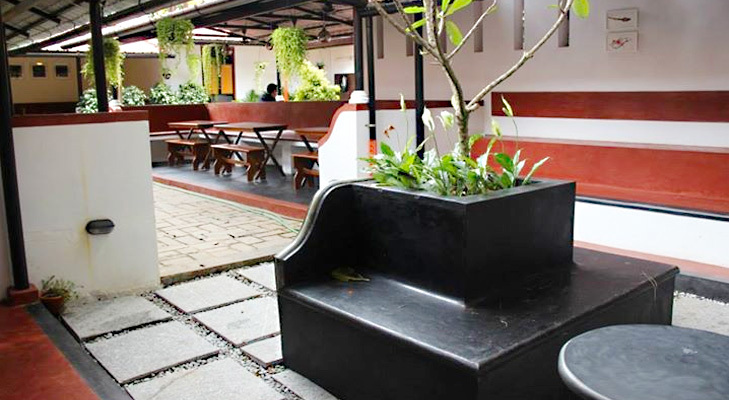 The use of white and maroon on the walls, the tiled roofs and the inner courtyard garden structure, resembling the typical ‘tharavadu’ of Kerala, all contribute to the subtle beauty of this place. Inspired by art movements, the four partners, who also wait on tables, cook and tidy up, aim to give diners a healthy experience by creatively combining fresh and natural ingredients. We kicked off with a cold coffee which was promptly served in a brew-your-own-drink-style with separate milk and sugar syrup. We like our coffee a bit light, but the exciting part is you are allowed to flavour the coffee to your taste. We moved on to the chicken cheese sandwich which was lovely. The bread was freshly baked at the café itself adding to the freshness of the sandwich which is the trademark of Dyu. For those of you who prefer veggies, they have a pasta salad with fresh green vegetables which is equally good. The desert options are either a date, walnut, lemon cheese cake or their daily classic chocolate cake. We are suckers for chocolate and wasted no time in placing an order for one. The cake was topped with oozing chocolate sauce-which is a chef special. And boy, was it special. The cake was moist and was the highlight of our meal. We interrupted our meal to take a look around at the art displayed and we didn’t know how the time passed by. Dyu Art Café is a great place to catch up with old friends, or even to come alone to be inspired and fed. The founders are always up for a chat about what you felt about the food and your feedback on the art or even just a conversation about art. DYU Art Cafe provides a much needed space for artists to get together and over a cup of coffee and chocolate cake.